The steel barque Manchester was built in Sunderland, England by William Doxford & Sons in 1892. She was 312' long with a beam of 46' and registered at 3,046 tons. She was owned by the Manchester Sailing Ship Company Ltd. of Liverpool, but was sold to Galgate Shipping Company Ltd. also of Liverpool in 1899. A fine looking four masted ship which was rated 100 A-1 by Lloyds. On August 23, 1900 she departed New York bound for Shanghai with a stop in Yokohama carrying a cargo of 124,168 cases of kerosene (about 4,500 tons) for the Standard Oil Company. The master, Frank Clemens and thirty men would take her around the horn of South America and on to the Orient, a long and dangerous voyage. In mid Sept. she may have passed through a hurricane which was reported by another British barque named Ellisland. Both ships sailed out of New York the same day and were in company until Aug. 26 when Manchester "outsailed" her. When Manchester was last seen it was said she was in fine trim. On Sept. 23rd the ship was in contact with a French steamer named Olbia about 350 miles southwest of the Cape Verde Islands. Clemens signaled to A. F. Matter, the master of the Olbia, "I come from New York, am bound for Japan, please inform my owners all well on board." Matter reported the sighting in Marseilles and also told them that when Manchester was seen she was under full sail and sailing well. As far as anyone knows this was the last time Manchester was ever seen. Her voyage would take months and nobody had any reason for concern. She was not due into port until late Dec. or even Jan. of the following year, however the ship never arrived. Finally in mid 1901 she was given up for lost. There was now only one thing left to do, hold an inquiry. This took place on Oct. 16th and 17th of 1901 at Liverpool. Not much could be said as there was no evidence to look over. All testimony presented to the board indicated that the ship was a fine vessel in good sailing condition. Both the owners and the builders were interviewed, neither could offer a reason their ship would have sunk. (Of course this would be expected.) However the New York pilot, James Brown, had no complaint about the ship and said she was in excellent condition and trim when she left New York. Her previous master, Sherwood Forrest, called the ship "one of the best sea boats I ever commanded, taking on board very little water and always behaving well." In the end the board could find no fault with the construction or the condition of the ship. They also found no evidence that she had been badly loaded or did not carry enough ballast. The board completed their inquiry without the latest information though. On Oct. 13th, three days before the board met, a report was filed in Tacoma, Washington. It seems that in July a local trading schooner came across some wreckage, many cases of kerosene and the body of a sailor on Bikar Atoll in the Marshall Islands. Some of the wreckage carried the name, Manchester. Further evidence, two boat keel marks in the sand, suggested that survivors had landed on the atoll and had later left in the lifeboats. Footprints of a woman and two children were found in the sand, these are believed to have been the footprints of Captain Clemens' wife and children, who were thought to have been onboard. It was surmised that the survivors, finding no fresh water or resources, less a few birds of which the blood had been drained to drink, shoved off from the atoll and presumably died of thirst before finding land again. None of the boats or the bodies were ever reported to have been found. This report however should be looked at with a critical eye. It was a second or third hand report originally learned of in Hong Kong by the crew of SS Glenroy, who three months later related it to the authorities in Washington. Who they learned the story from was not identified in the report, but it is unlikely that the crew of the local trading ship was in Hong Kong to tell the tale. Therefore it must have been told and retold by at least two other parties. The report also seems to have a lot of detail, which seems curious. The local trading ship's crew apparently spent some time looking around on the atoll for evidence, even noting the size of footprints in the sand as being a woman and two children. Perhaps the children's footprints could be distinguished, but a woman's foot, while usually smaller than most men's, would be hard to positively identify. The vivid detail of the keel marks left in the sand when the two lifeboats pushed off is also suspicious. If the ship was lost in November, December or even January these marks were not found until July. Depending on when the survivors landed it would still mean that these marks were clear months after being made. Would not the tide or a heavy surf wash them away at some point? Now about the birds whose blood had been drained. For anyone to know this may require an autopsy of some sort. How exactly does one tell if a dead bird has any blood remaining in its body. It is also strange that the birds bodies wound not have decomposed unless the survivors had left within a few days of the trading ship arriving on the scene. A bird decomposes rather quickly and of course it would be consumed by small insects as well. This one part of the story is the most suspicious to me. Of course we cannot forget about the wreckage which was conveniently was marked "Manchester." Exactly what kind of wreckage this was remains unclear. To me this all make a very suspicious story. There is one other thing that bothers me about this report, why would a local trading ship sail to an uninhabited atoll with no known resources. Bikar Atoll does not appear to be on the way to anywhere and one would seem to have to be going there to end up there. Other than the story told in Hong Kong there does not seem to have been any concrete evidence produced to establish the true fate of the ship or crew. I can make no definitive statement about the fate of this ship and those in her, but it would not be out of the question that foul play could have caused the loss of Manchester. She was a stout ship, not all that old, in fine condition and had weathered many storms without incident. In fact she had been in a typhoon during a voyage from New York to Shanghai in early 1899. She was hove-to for 18 hours and came through in excellent shape. 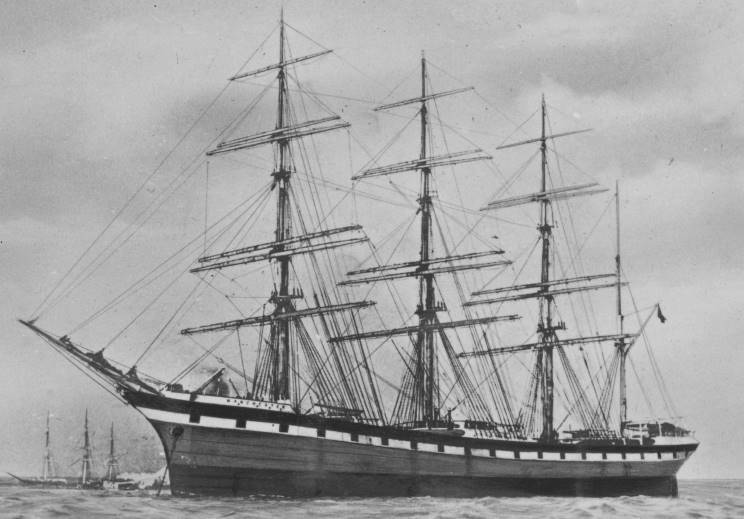 The inquiry, having no evidence, finished up with the following: "The court, having carefully inquired into the circumstances attending to the above-mentioned shipping casualty, finds for the reasons stated in the annex hereto, that the evidence is not sufficient to enable any opinion to be formed as to the cause of the supposed loss of the said vessel." Over one hundred years later one thing is for sure, we will never know what happened to the barque Manchester and the thirty-four souls in her. "Missing On The High Seas, Remembered Forever "